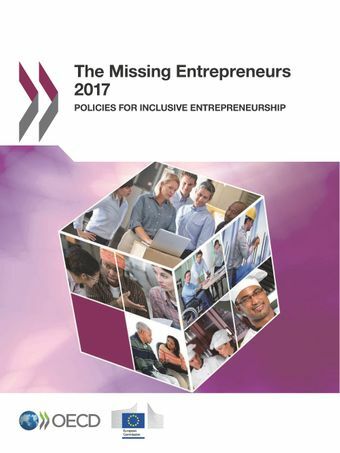 The Missing Entrepreneurs 2017 is the fourth edition in a series of publications that examine how public policies at national, regional and local levels can support job creation, economic growth and social inclusion by overcoming obstacles to business start-ups and self-employment by people from disadvantaged or under-represented groups in entrepreneurship. It shows that there is substantial potential to combat unemployment and increase labour market participation by facilitating business creation in populations such as women, youth, the unemployed, and migrants. However, the specific problems they face need to be recognised and addressed with effective and efficient policy measures. This edition contains in-depth policy discussion chapters on the quality of self-employment, including new forms of self-employment such as dependent and false self-employment, and the potential of self-employment as an adjustment mechanism in major firm restructuring and job shedding. Each thematic chapter discusses current policy issues and challenges, and makes recommendations for policy makers. A data section provides a range of information on self-employment and business creation rates, barriers and key characteristics of businesses operated by social group. Finally, country profiles highlight recent trends in inclusive entrepreneurship, key policy challenges and recent policy actions in each of the 28 EU Member States. There were 30.6 million self-employed people in the European Union in 2016, of which nearly 10.0 million were women, 763 300 were youth, 11.8 million were seniors, 635 000 were unemployed (in 2015) and 3.4 million were immigrants. While there are overlaps between these groups, it is clear that entrepreneurs from under-represented and disadvantaged groups are significant in number. Yet these groups are under-represented relative to their share in employment. For example, women are only half as likely as men to be self-employed and only 4.1% of working youth were self-employed. There is unrealised entrepreneurial potential among these groups that public policy can help unlock. OECD (2016),”Indicators of gender equality in entrepreneurship”, OECD Gender Portal, available at: www.oecd.org/gender/data/. To increase the quantity and quality of entrepreneurship activities by these groups it is important to understand the barriers that they face in business creation. This report shows, for example, that women are less likely to report that they have the skills and knowledge to start a business than men (34.1% vs. 49.9% for men in the European Union between 2012 and 2016, and 36.8% vs. 51.2% for men in OECD countries). Similarly, youth also face challenges due to a lack of skills and experience in the labour market, while the barriers faced by seniors vary depending on individual circumstances, entrepreneurial intentions and experience. Public policy needs to be designed to help people from these groups have an equal opportunity to be successful in entrepreneurship, regardless of personal characteristics and background. The OECD is working with the European Commission, DG Employment and Social Affairs to examine the barriers faced to business creation and self-employment by people who are disadvantaged or under-represented in entrepreneurship activities - youth, seniors, the disabled, women, ethnic minorities, the unemployed and others - and the public policy actions that can promote and support these activities.